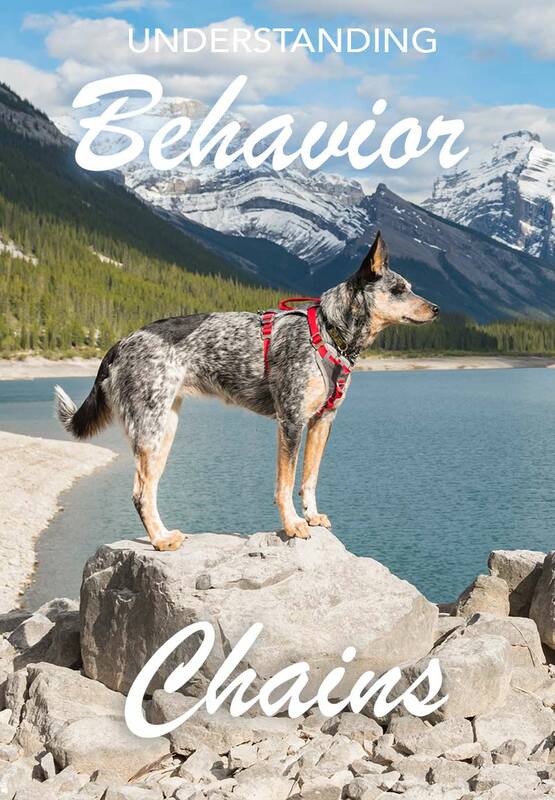 Behavior chains are important in dog training. There are times when you need to avoid behavior chains, and times when behavior chains are very useful. What Is A Behavior Chain? Dog trainers refer to each action a dog makes as a “behavior.” It sounds a bit “science-y,” but there isn’t really another quick way to describe it. So when your dog sits in front of you, that’s one behavior. When your dog walks around you, that’s another behavior. When your dog walks next to you at heel, that’s another. A behavior chain is simply a string of individual behaviors joined together in a sequence. It’s easy to see how these chains are very useful. They enable us to teach a dog more complex tasks and sequences of behavior without stopping to reward him every few seconds. But behavior chains can also get inexperienced dog trainers into trouble, because behavior chains can be bad as well as good. There is a rut that many novice dog owners get themselves into, and find it difficult to get out of. It happens when they teach the dog not to do a naughty thing by rewarding him when he stops. After all, that’s what lies at the heart of positive dog training, isn’t it? Focusing on, and rewarding, the good, rather than focusing on, and punishing, the bad? The problem is, when you reward the dog for stopping the bad thing, the dog sometimes keeps repeating the naughty thing, albeit briefly, in order to get the reward when he stops! You’ll sometimes hear this referred to as ‘yo-yo’ behavior, or a bad behavior chain. Let’s say you have a dog who jumps up. You know what to do. You decide to teach an alternative behavior. Four Paws On The Floor. All well and good. You start to teach your dog. He puts his paws on your leg. You ignore him. He scrabbles away at your leg. You ignore him. You wait. He scrabbles. You wait, very patiently, clicker in hand. And the instant he puts his paws back on the ground, you click and treat. You wait for him to jump up again. Again you ignore him. The scrabbling goes on for a while. Again, as soon as he puts his paws on the ground, you click and you treat. The scrabbling is soon much less persistent. In the space of a day or two, your dog is soon putting his paws back on the ground really quickly. This really works! Which is fantastic. Impressed with your success, you keep training. And training. But, oh dear. A week later, and the dog is still jumping up. In fact, he is jumping up over and over again. Each jump up is now very brief – he gets straight down again. But he is still putting his feet up on you. Why hasn’t he stopped doing that? Could it be that this method of training doesn’t work after all? The answer is that you have cleverly and inadvertently trained your dog to carry out a ‘yo-yo’ behavior. You have taught the dog a behavior chain. In this case, the chain consists of “jumping up + getting down” followed by more jumping up and getting down again. You have associated the reward with a pair of behaviors that are linked together, instead of the behavior that you actually want to see. Lots of people do this, it’s a common mistake, and we can fix it. Better still, we can avoid it happening in the first place. I call the method I use “treat streaming.” It means literally supplying the dog with a stream of treats when he has stopped the bad behavior, rather than waiting for him to repeat the bad behavior again. So for example, the dog who jumps up will be given not one treat when he puts his paws on the ground, but one treat, then another, then another, with no gaps in between. Don’t panic. This is temporary. You are not going to become an automatic food dispenser. I’ll explain in a moment. Most people, especially those that come from a background of traditional dog training, make the mistake of using far too few treats when training. Training with treats often has a faster pace than traditional training and this can feel alien and weird at first. It seems natural to take things more slowly, have breaks between behaviors and cues. Not to mention worrying about just how fat your dog is going to get if you feed him all this stuff! But here’s the thing. Treat streaming is not forever. Often within a few minutes, and certainly within a few sessions, you will start to space out the gaps between the treats. Let’s go back to our ‘jumping up’ dog again. As soon as your dog has figured out that placing his feet on the floor earns a click and a treat, you can start treat streaming. Once your dog has placed his four feet on the floor, you will place a treat on the floor in front of him. Immediately, while he is eating it, place the next treat in front of him. Do this five or six times, one treat after another. Now count two seconds in your head before placing the next treat on the floor in front of the dog. If he jumps up before you get to two seconds, do another five or six repetitions of treats with no gaps between, then widen the gap a fraction (e.g. say “one thousand” in your head). Repeat several of these short gaps again before trying a two-second gap again. Once you have your two-second gap, you can build on this. Aim for a three-second gap next, then four, then five, then seven. Build up the time slowly. You are building good habits here. They will last a lifetime, so don’t be in too much of a hurry. The term “training treats” is a bit of misnomer, really. They are not really treats, in the way the humans mean “treats.” You are not (or shouldn’t be) using chocolate or sweets. You should be using food. And when you are using a lot of treats, as in this ‘streaming’ phase, you need to deduct the food you use in training from your dog’s daily food allowance. Your dog’s total daily food allowance needs to include the food you use in training. 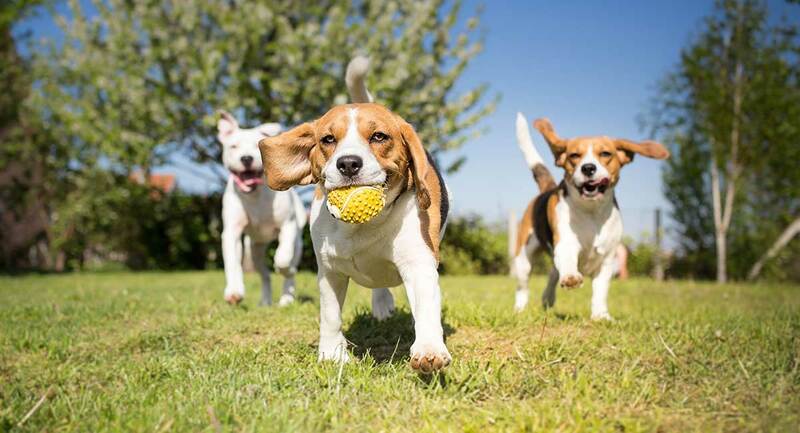 Indeed, at certain points in training, especially with rescue dogs or puppies, the dog’s entire daily food allowance may be delivered during training sessions. That’s right, no mealtimes at all! But won’t that make your dog sad? The answer is no. Dogs don’t mind when or where their food comes, as long as it comes. Dogs that are used to mealtimes ‘on the clock’ may feel a bit strange for a day or two when feeding hour comes and goes. But that soon passes, especially if you take a walk or play a game at that time instead. So, treat streaming is a useful strategy to avoid or resolve the issue of bad behavior chains. When you use food regularly in training like this, you are going to use quite a lot of it. It isn’t forever. But it is quite intense while it lasts. So it does need to be quality food, and the quantity needs to be deducted from your dog’s daily food allowance. If you do this, your dog will not get fat. And your training will flourish. Have you used treat streaming to resolve a problem? Do you use much of your dog’s food up in training? Let us know how you get on if you decide to have a go with this useful technique.